South Carolina Senator officially announces presidential bid, says he is "ready to be commander-in-chief". 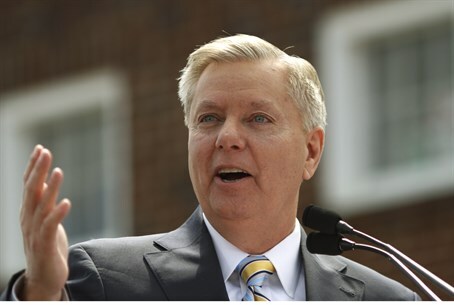 South Carolina Senator Lindsey Graham on Monday officially announced his presidential bid, saying he is “ready to be commander-in-chief on day one,” ABC News reports. "I’m pretty sure no one here, including me, ever expected to hear me say, 'I’m Lindsey Graham, and I’m running for president of the United States,'" he told a cheering crowd in Central, South Carolina. "I have more experience with our national security than any other candidate in this race. That includes you, Hillary," he said, referring to former Secretary of State Hillary Clinton, who will be running for the Democratic nomination. "I know the players, I know our friends and I know our enemies alike -- but most importantly, ladies and gentlemen, they know me," added Graham. "The Obama Administration, and some of my colleagues in Congress, have substituted wishful thinking for sound national security strategy," Graham, 59, said. “I want to be president to defeat the enemies trying to kill us, not just penalize them or criticize them or contain them, but defeat them." Two weeks ago Graham all but officially confirmed his plans to seek the Republican nomination, saying in a televised interview he’d be running because “the world is falling apart”. Graham joins an already-crowded Republican field, with more candidates expected to declare later this month. Other candidates for the Republican nomination include Marco Rubio, Ted Cruz and Rand Paul who have already announced their intention to run for the GOP nomination. Former Florida Governor Jeb Bush has yet to formally announce he is running but he said on Sunday he would make a final decision after an upcoming trip to Europe. Graham last week visited Israel, where he promised to respond with a “violent pushback” if the United Nations attempts to force a resolution to the conflict with the Palestinian Authority on Israel. “I am in charge of the foreign assistance account, I’m in charge of the money we provide for the United Nations,” he said in reference to his chairmanship of an appropriations subcommittee.